One of the good features of Windows is the screen setup. Many users use Windows without knowing that they can change the screen and so get a new look and also save their eyes. 1. a special program designed for changing colors and resolution (the least often used method). 2. opening the Display option (1. Start - Settings - Control panels - Display. 2. Click the right mouse button on the desktop and choose Properties. 3. In the command line, use the control desktop command). To access the settings for resolution, color depth and others use the Settings panel. Screen resolution - you can set the screen resolution here. The value determines the screen display in number of dots (pixels) in horizontal and vertical lines. The higher resolution, the more details you will see on the screen, however, this can cause that everything is too small and difficult to recognize. The resolution you set up is a combination of the size and the properties of your monitor, the graphic card properties and your eyes´ needs. More information about resolution you will find bellow. More information about monitors and graphic cards you will find in our articles. Color quality - number of displayed colors. It says how many bits are used to save the color information of each dot. The most frequently used are High Color and True Color according to the graphic card´s capabilities. 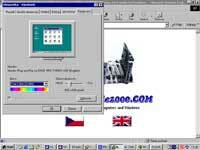 For True Colors with the resolution of 800x600 you need a 2MB graphic card, with 4MB you can set the resolution of 1280x1024. The maximum resolution for monitor - more information you will find in the "Monitors" article. The maximum resolution and color quality supported by the graphic card - the higher resolution, the more the number of colors and the frame frequency lower. Recommended resolution 2 - Optimal resolution according to the viewable screen area. If you choose a higher resolution, the letters and all other images become very small, then the work may not be pleasant - everything depends on the user´s activity and eyes. The resolution used for common work on the computer usually differs from the resolution used for computer games. Current resolution - currently used resolution that has been set upon installation or later by the user. 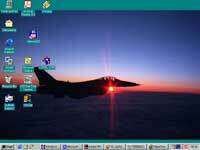 640x480 - rather for older monitors having the size of 14". This resolution is usually used for DOS applications. True colors will be processed even by a 1MB graphic card. The 14" monitors are not being manufactured any more and this resolution is used very rarely. 800x600 - at present it is the minimum resolution for 15" monitors (some of the improved 15" monitors also handle the resolution of 1280x1024, but that is not the real thing). You will see much more. Most Internet sites are optimized just for this resolution. To be able to use true colors, you need a graphic card with minimum of 2MB memory. It is recommended that you use 800x600 or 1024x768 for a 15" monitor. Some older monitors cannot handle these resolutions and so they cannot be used. 1024x768 - Minimum resolution for processing graphics on 17" monitors (the quality ones can handle up to 1600x1280). True colors require a graphic card with 4MB memory. 1280x1024 - Optimum resolution for 19" and 21" monitors, convenient for working with graphics. 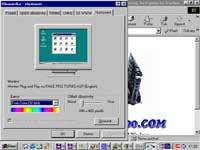 You can use true colors if you have a 4MB graphic card. 1600x1200 - can be used for 21" monitors, graphics processing, DTP and CAD. Graphic cards with 8MB and higher are recommended. 1800x1440 and higher - possible resolution for future monitors and other display technologies - e. g. projecting screen, 24" and 29" monitors. Panels for the frequency and the hardware acceleration setup. Display vga driver (Adapter Properties), setting color profile for monitor. Other panels differ according to the type of the card, the drivers and manufacturer. The Adapter card shows information about the graphic card and the appropriate driver. The driver can be changed through the Properties button (it opens the standard information and configuration panel of the driver). By pressing the Display all modes button you will open a list of different resolutions and frequencies, by a single click you can choose desired resolution and frequency. The Monitor panel - here you can set used frequency and type of your monitor. The check field is here to disable you from choosing an incorrect frequency which your monitor is not able to display. There is a disadvantage - the frequency can be set up by too high value steps and so you are not always able to set up the highest supported frequency. By choosing a frequency which is not supported by the monitor, you might damage the monitor. In the Properties you can change the monitor's driver, the most frequent and also the surest option is "Monitor Plug and Play" in "Standard types of monitors". Information about the connection of several monitors to a computer you will find in the Using several monitors on a computer article. Further information to this topic and information about desktop configuration you will find in the articles related to the Desktop. If the resolution is not displayed correctly, or the resolution and the color depth cannot be adjusted, you have not probably specified the graphic card and the monitor correctly. Check the types and install appropriate drivers. In case you have problems when using Plug and Play or you have an unknown graphic card, you can use a universal driver which will only activate the basic functions of the card. If you have problems with starting the system resulting from incorrect resolution setup or from using inappropriate drivers, use at the start the VGA mode, emergency mode or the last known configuration.